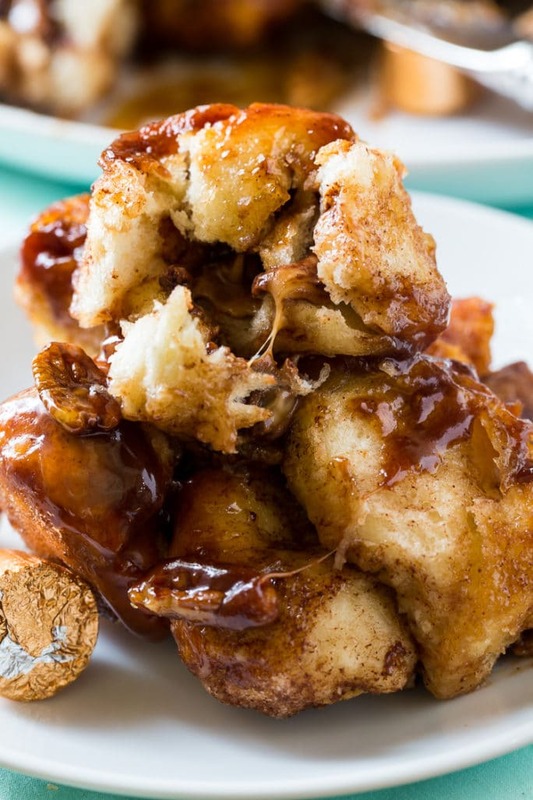 Chocolate-Caramel Monkey Bread has a gooey chocolate caramel candy melted in every bite. 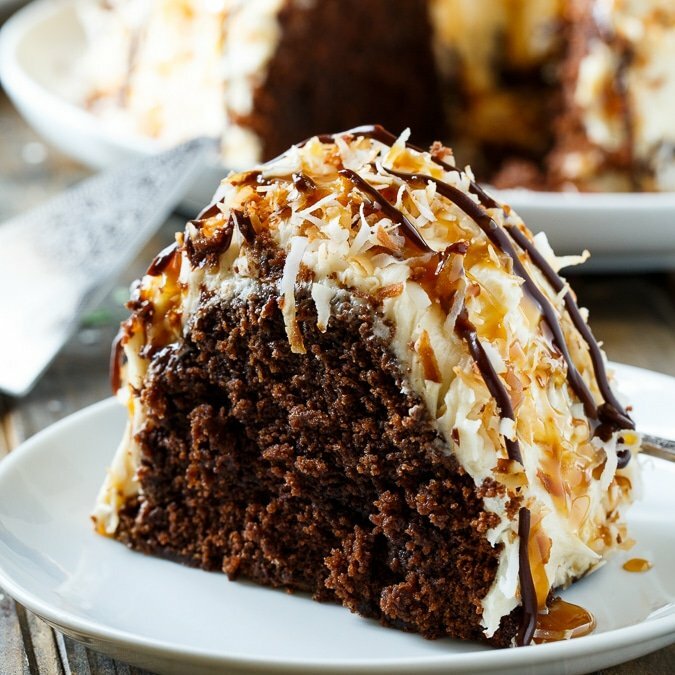 It’s loaded with both chocolate and caramel plus a few pecans for some crunch. 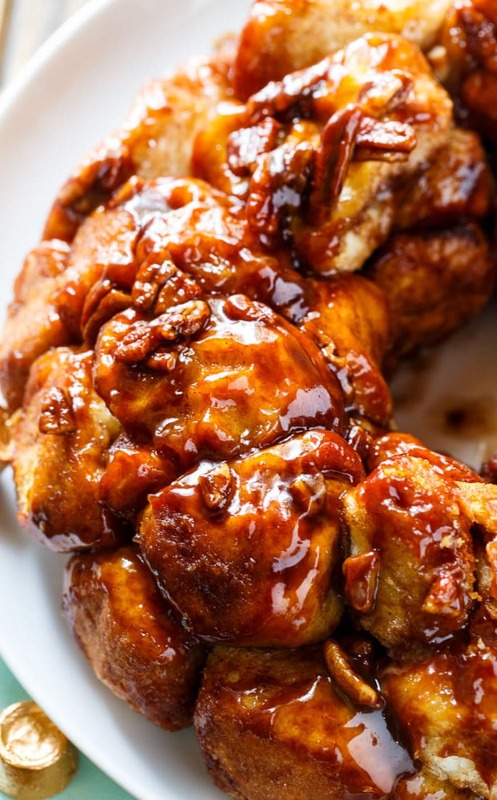 You won’t find a sweeter, more dessert-like Monkey Bread than this one. 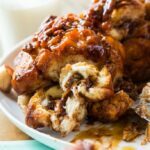 My go-to basic Monkey Bread recipe is THIS ONE and I love this Bacon Maple Monkey Bread. But if you’re looking for a candy-like Monkey Bread, this Chocolate-Caramel Monkey Bread made with Rolo candies is hard to beat. It’s super easy to make from refrigerated biscuit dough. 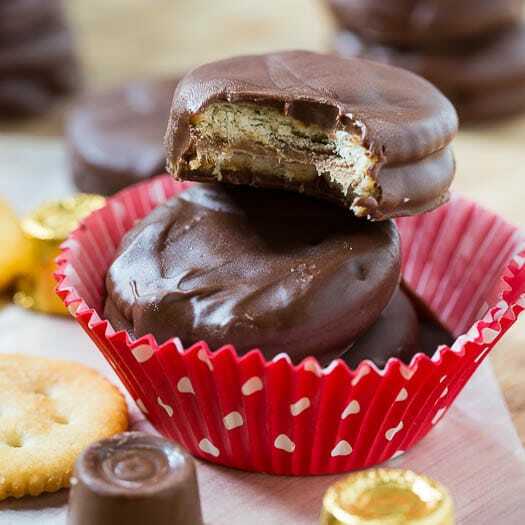 Each biscuit gets cut in thirds and wrapped around a Rolo candy. The most time-consuming part of this recipe is unwrapping all those candies and stuffing them in the biscuit pieces. Each biscuit ball gets dipped in melted butter and then coated in a mixture of sugar, cocoa powder, and cinnamon. Pecans and a little caramel sauce get drizzled on top before it is popped in the oven. 45 minutes later, it’s ready to be devoured! Never miss a recipe. Follow Spicy Southern Kitchen on Facebook, Pinterest, and Youtube. Preheat oven to 350 degrees. Butter a 10-inch Bundt pan really well. Sprinkle half the pecans in the bottom of the pan. Combine both sugars, cocoa powder, and cinnamon in a large plastic bag. Cut each biscuit into 3 pieces. Flatten each biscuit piece somewhat, place a Rolo in the center, and bring the dough up and around the Rolo to form a sealed ball. Working about 4 balls at a time, dip in butter, and then add to sugar mixture in plastic bag. Shake to coat them and then place the sugar coated balls in the Bundt pan. Repeat with remaining biscuit balls. Sprinkle any remaining sugar mixture on top of the biscuit balls in the Bundt pan. 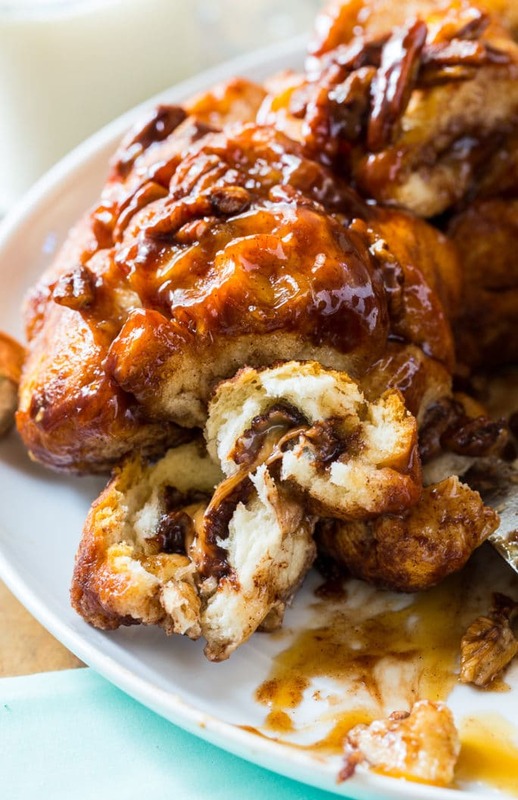 Drizzle any leftover butter on top along with 2 tablespoons of caramel sauce. Disclosure: This post contains affiliate links. 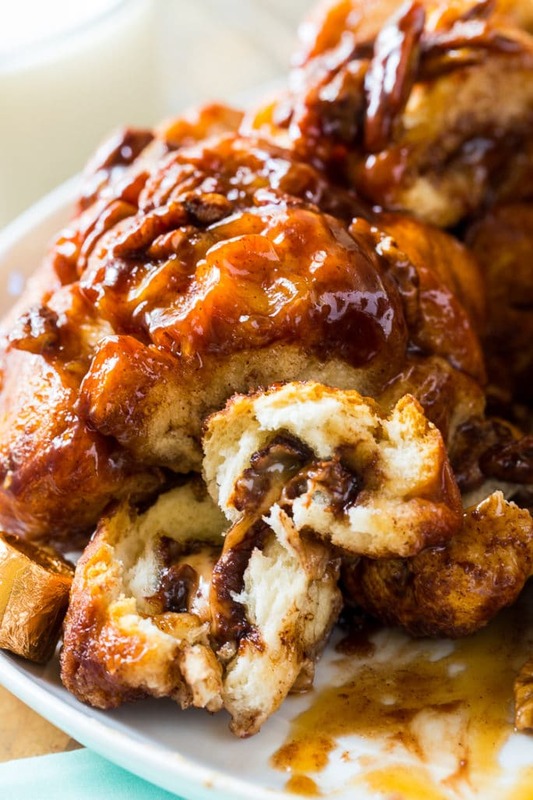 This entry was posted in Breads and Muffins and tagged caramel, chocolate, Monkey Bread. Bookmark the permalink. My name is Christin and trying new foods and experimenting in the kitchen are my greatest passions. Delicious recipes delivered straight to your inbox! 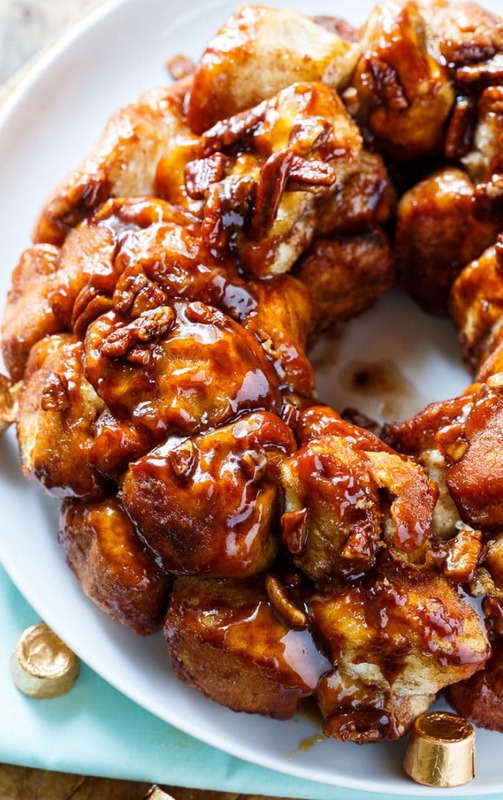 Visit Spicy Southern Kitchen| Christin Mahrlig's profile on Pinterest.